New York: The World Health Organization’s World Malaria Report 2012, released today, notes a continuation of progress in 2012, but also sounds the alarm on a looming financial crisis that threatens to stall or even wipe out recent gains against the disease. The current scale-up in the fight against malaria has saved more than one million lives over the past decade. As documented in the WHO report, funding is urgently needed to replace insecticide-treated bed nets, which have a three year lifespan, and to expand treatment and diagnostic testing. If nets are not replaced, individuals previously protected from malaria become vulnerable, leading to potential epidemics. Children are most at risk. Approximately US$3.6 billion in additional funding is required in sub-Saharan Africa between now and 2015. In order to stave off backsliding and resurgences as early as 2013 and 2014, US$2.4 billion is urgently required, of which US$1 billion is required in Nigeria alone. This funding shortfall is occurring just three years before Secretary-General Ban Ki-moon’s deadline for reaching near zero malaria deaths at the end of 2015. 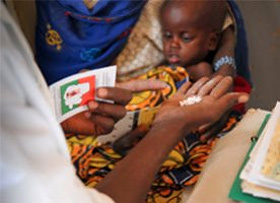 The report documents significant progress over the past two years, with deliveries of Rapid Diagnostic Tests (RDTs) increasing from 88 million in 2010 to 155 million in 2011, and WHO-approved drugs for treating malaria increasing from 158 million in the public sector in 2009 to 278 million in all sectors in 2011. Access to Long Lasting Insecticidal Nets (LLINs) remained constant with nearly 300 million usable nets having been delivered since 2010. Since 2007, funders, led by The Global Fund to Fight AIDS, TB and Malaria (accounting for over half of all external malaria funding), The United States President’s Malaria Initiative, the United Kingdom, and the World Bank, UNITAID, and other partners have invested over $10 billion in reversing the course of the disease, protecting hundreds of millions of children, women and men with lifesaving commodities, primarily in sub-Saharan Africa, where over 90% of malaria deaths occur. The replenishment and recapitalization of the Global Fund, which has emerged from a year of crucial reforms, in September of 2013 will be a decisive factor in determining if the progress is able to be maintained, as will additional funding from other primary funders, including the World Bank’s International Development Association, or IDA, which is also seeking a replenishment next year, and continued support from the United States and United Kingdom. To address these critical funding issues, last week meeting in Dakar, Senegal, the Board of the Roll Back Malaria Partnership (RBM) agreed to a series of immediate actions to redeploy existing and new resources to address these gaps.